Over the past few weeks, I have been debugging the Client/Server, DAQ, and wiring the system to the wind tunnel. I finalized the microcontroller code, installed it in the system, and connected the 12V power from the power supply to the circuitry. I then interfaced the networked server to the microcontroller, relays, and sensors via the DAQ. Using two ports on the microcontroller, I can do movement triggering and movement sensing through the system to the user. I modified the sliders used in the client to be shown as 0-100% of actuator height possible in the system. 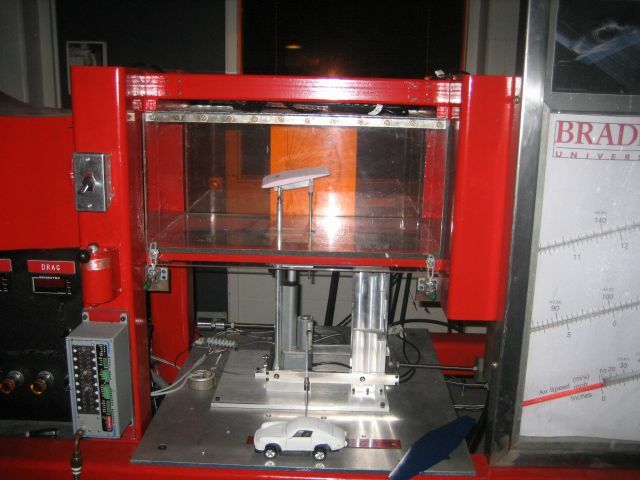 The input is restricted as to prevent damage to the wind tunnel by setting the actuator to be too high or too low. The relays are wired to digital outputs on the DAQ, but are untested and not connected to the high-voltage systems on the wind tunnel. I have verified that the DAQ is capable of sourcing the current required to switch the relays at low voltage, but higher voltages are still in question. The key components of actuator control, networked client/server LabVIEW programs, and DAQ interface to the actuator and sensors are complete. The final presentation is being prepared, as well as the poster required for the Student Expo and the industry review board. Some testing and debugging of the relays, more and complete documentation, and presentation preparation are the focus of the remainder of the semester. Check the LINKS page for further updates of documents. The laboratory notebook contains all other pertinent information not found on this site.